Silicone, not to be confused with Silicon, a chemical element that exists in nature, was first polymerized in the late 19th century. Not much was done with it until the 1930s when a chemist at Dow Corning refined it for use as a lubricant in submarines and planes. The first known medical use of silicone was during World War II as a lubricant for glass syringes. Since then, silicone has regularly been used in electronics, cookware, the automotive industry, and especially in the medical field due to its biocompatibility. Silicone is used in liquid form as a lubricant, and in gel form as bandages, dressings, breast implants, contact lenses and more. Because silicone is extremely biocompatible, studies have shown no marked harmful effects on humans or the environment. Despite the science, in the 1980’s several diseases were directly attributed to breast implants. Fear and panic spread as the media spun stories of breast implants causing various maladies even though existing research did not corroborate the reports. Surgeon and historian Jack C. Fisher, author of Silicone on Trial: Breast Implants and the Politics of Risk, sits down with Dr. David Granet to discuss the controversial history of silicone medical devices – including breast implants. Though the fear surrounding their usage was unwarranted and not based in scientific fact, battles waged about their safety and government regulation followed suit. Dr. Fisher argues that regulatory policy should rely on valid science and not on the fear of risk. 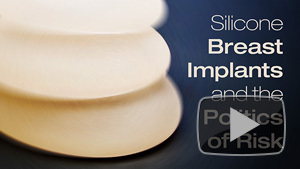 Watch Silicone Breast Implants and the Politics of Risk, and browse more programs on Health Matters.